One thing missing from Elgato’s line of Mac-based, TV-tuning, DVR-replicating products has been the capability to easily record content from cable or satellite sources, and in HD quality to boot. The EyeTV HD finally fills that void, and in a very nice way. The EyeTV HD differs from most of Elgato’s other offerings in that it isn’t a TV tuner—it’s a video-capture device. That’s because the encrypted signals from your cable or satellite provider require a decoder—a receiver or DVR, for example—to play on your TV. Elgato leaves that work up to your set-top hardware, but takes over from there. The EyeTV HD is a combination of a recording box with an H.264 encoder inside, the EyeTV 3 software you run on your Mac, and an infrared channel changer (often referred to as an IR blaster) that relays commands to your set-top box just as a standard remote does. It also includes all the cables you’ll need to get started. Like other EyeTV hardware, it’s bus powered using the USB 2.0 connection. Because HDMI connections employ copy protection, the EyeTV HD uses analog component video connections with your set-top box to take advantage of the so-called “analog loophole”—signals sent over the analog output aren’t encrypted. Component video (and therefore the EyeTV HD) supports up to 1080i resolution. Elgato also includes a breakout cable for composite and S-Video connections. Audio is limited to stereo via RCA-style analog connections. I tested the EyeTV HD with an H20 HD receiver from DirecTV, connected to a new Core i5 2.53GHz 17-inch MacBook Pro ( ). 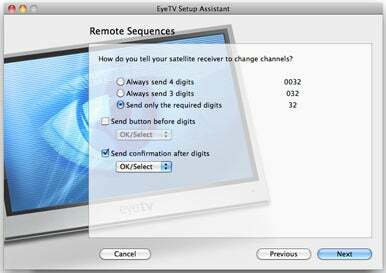 Because you connect the EyeTV HD to a set-top box, you’ll obviously need a Mac within USB-cable range of one TV in your abode. That might mean using a laptop or having a very long USB cable running across the floor. The Setup Assistant helps you make sure everything is working fine. The EyeTV Setup Assistant did a fine job walking me through the process of hooking up the hardware and configuring it to work with my receiver, picking my TV provider and channel lineup, and testing the IR blaster to make sure everything was working right. The whole process took less than 10 minutes. The EyeTV software works pretty much the same as it does with the EyeTV Hybrid (2010) ( ), with a few notable differences. With the EyeTV HD, you can choose to encode video in Best, Better, or Good quality, which captures video at the same resolution and frame rate as the source output (although you can’t tell what the bit rate or hard drive space requirements are for each unless you’re actually capturing video), or encode for iPad (scaled to work on Apple’s portable device). At the same time, however, you can also create a 480-pixel-wide iPhone version—the hardware can encode two streams simultaneously. Doing so takes up more room on your hard drive, but makes it much faster to export the video to iTunes for syncing to your iPhone or iPod touch. However, I encountered a major bug in the software that caused problems using the Export option in EyeTV—recordings didn’t export with the proper frame sizes for their respective presets. For example, I exported the same 1080i episode of The Daily Show to iPhone, iPad, and Apple TV formats, and all three had the same 640-by-360-pixel dimensions. Elgato says this problem will be fixed in the next update to the EyeTV software. Otherwise, you can find, watch, schedule, record, and edit programs just as you would with any other EyeTV-powered product. Even though the EyeTV HD process takes analog video output and re-encodes it, I found the quality of recordings to be very good. One thing I found annoying, though, was the fact that the Program Guide for my DirecTV setup didn’t show whether programs were being broadcast in HD. The EyeTV Hybrid at my desk, which receives over-the-air signals via an antenna, does provide that information. As part of the release of the EyeTV HD and the latest version of the EyeTV software, Elgato has also updated its $5 EyeTV app—which lets you watch live or recorded programs, as well as schedule recordings—to run as a native iPad app. However, when this review was posted the company was still waiting for Apple to approve the new version. Elgato’s EyeTV HD comes with everything you need in the box, and does a pretty good job letting you watch and record premium cable and satellite content—despite a few software bugs.